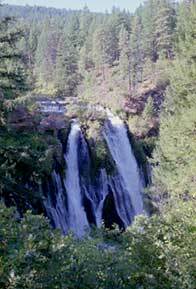 McArthur-Burney Falls Memorial State Park is within the Cascade Range and Modoc Plateau natural region, encompassing over 900 acres of forest and boasting five miles of streamside and lake shoreline, including a portion of Lake Britton. The park's centerpiece is the 129-foot Burney Falls, which is not the highest or largest waterfall in the state, but possibly the most beautiful. The Falls create Lake Britton with the finest fishing in the area. Located just one hour southeast of Edgewood Estates.